People are creatures of habit—from getting out of bed at the same time to starting the day by visiting the same website and going to the same place for a morning coffee on the way to work. Although consumers’ habits may be hard to change, doing so can have a significant impact on a business. While the number of trips per week that consumers make to convenience stores has decreased, consumers continue to frequent convenience stores for coffee purchases. These coffee purchases can be the key to reversing that trend in visit frequency, as well as increasing spend. After all, if people become accustomed to getting their morning coffee from a specific location, it’s natural for them to make that a regular—perhaps even daily—habit. And if they’re already visiting a certain c-store for coffee, it would make sense for them to fill up an empty tank, buy a sandwich for lunch or make another kind of purchase, too. Coffee seems like such a small purchase, but it can really be a catalyst for changing customers’ behavior and generating more revenue. So how can retailers perk up their coffee programs? Sometimes the simplest solution can have the most impact. Basic signage in store windows and at the fuel pump will remind customers of offerings and may prompt a craving. And with 70% of consumers stopping at c-stores only for fuel, reminding them of coffee and triggering that desire for a hot cup can make a substantial difference. In fact, a study conducted by Coca-Cola found that 32% of c-store customers noticed signage and were influenced to make a purchase on the same visit. An additional 21% noticed the signage and were influenced to make a purchase in the future. In short, signage is too important to ignore. Beyond just posting “we have coffee” signage, retailers should consider including coffee in promotions. Retailers can run an “add-on” promotion for select items, as in “buy a coffee and get a discounted breakfast bar.” They can run a limited-time offer with special new seasonal flavors. And if they are willing to sacrifice the margins, they can even tie in fuel discounts by offering a “buy X number of coffees and get a Y% fuel discount” promotion. 2. Amp up loyalty programs. Punch cards and digital punch card programs are easy to set up and simple for customers to use. But best of all, they’re incredibly effective when done correctly. Group A received a punch card that would be stamped each time they got a car wash. When they filled up their eight-stamp card, they got a free car wash. As the people in Group A got closer to their reward, their time between visits actually decreased from 18 days to 13 or 14. That’s an incremental increase of six to eight visits per year per customer. Group B likewise received a car wash punch card, but instead of being given an eight-stamp card, they got a 10-stamp card with two stamps already rewarded. Both groups still had to get eight car washes to get the final car wash for free, but Group B started out with 2 complimentary punches. The result? The time between washes decreased even more as the reward grew closer, dropping from 15 days to just 11. Visiting every 11 days as opposed to every 18 equates to 13 more visits per year per customer. Employing some proven psychology can make customers feel valued while inspiring them to earn rewards. It can also make quite a difference to a store’s bottom line. Customers want to interact with stores in the way that’s most convenient for them. And while a punch card may work best for some, others might prefer a digital punch card program that can be accessed on their phones. Connecting with customers via an app or optimized website allows retailers to send messages that influence behavior. Push notifications, for instance, appear on customers’ devices and can be a great way to convey members-only offers. SMS text messages have a 98% read rate and a 45% response rate. Needless to say, a simple text message can have a massive impact on customer behavior. Geofencing encourages visits by sending messages to customers when they are within a certain radius of a certain store. It can also revolutionize your pump-to-store promotions, as a message promoting “buy X amount of a product and get Y cents off per gallon” can be sent to customers while they’re at your pump. It’s easy to take a coffee program for granted, but it can have a strong influence on people’s habits. Being able to upsell that coffee into greater spend and increased visits will help turn the coffee program from lukewarm to piping hot. 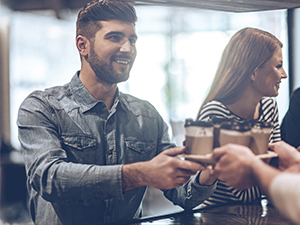 If you would like help with optimizing your coffee program or want to discuss loyalty programs in general, our experts can help. Learn more about convenience store loyalty programs here.